This Saturday was my birthday and for a surprise Tom took me to the latest baby from the Hawksmoor emporium Foxlow in Clerkenwell. Now I’ve never been to Hawksmoor but am told the two are very comparable, both focusing on a meaty, hearty menu and unusual cocktails. 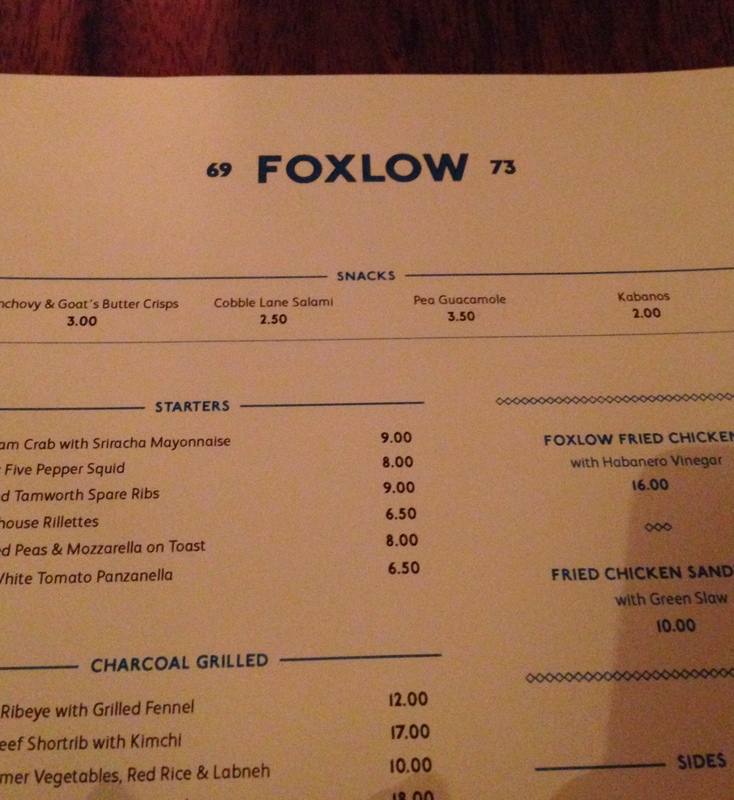 Where they differ though is the price (Foxlow is much more reasonable) and the decor and atmosphere. 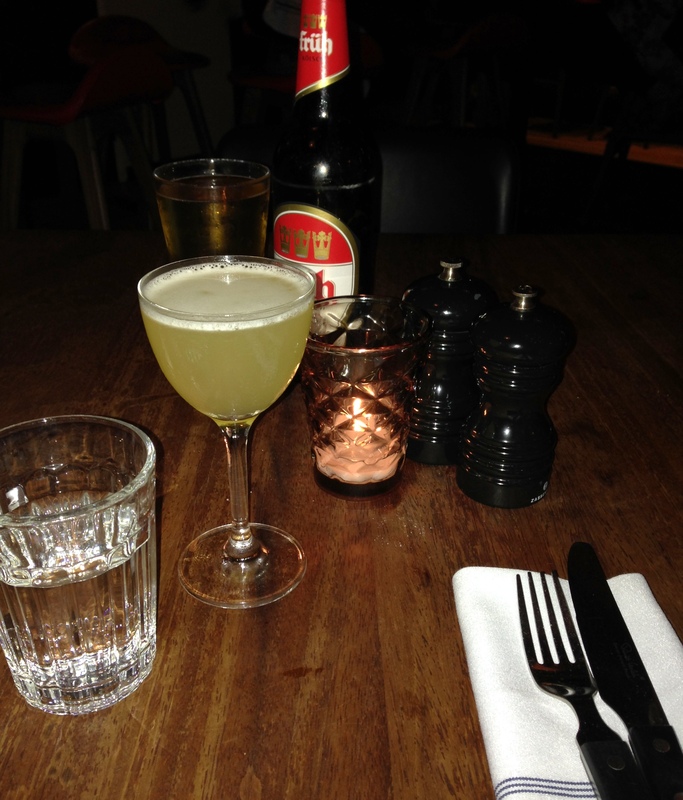 Foxlow is cool, laidback and unfussy. It’s not a grandiose steakhouse trying to impress but rather it tries to appear as laid-back and neighborhood friendly as possible. 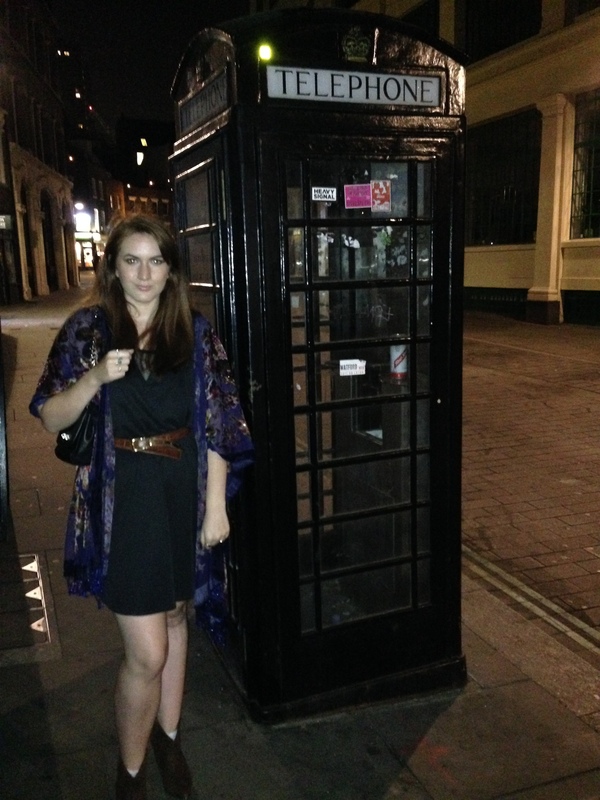 Ignoring the fact that no one actually lives in Farringdon it does a good job of achieving this. For example the restaurant is cleverly split up into three mail dining areas mostly out of view from each other; I only saw the third area on my way to the toilets. This gives you the impression you are in a much smaller restaurant then you actually are making the whole vibe more intimate. It took a while to get served we had to flag down a waitress after 20 minutes although once we did she was very friendly and knowledgeable about both the drinks and food menu. To start she helped me choose the St John’s Cocktail for me which was both sweet and sour my perfect combo, Tom was impressed with the choice of beers and had a Fruh Kölsch. 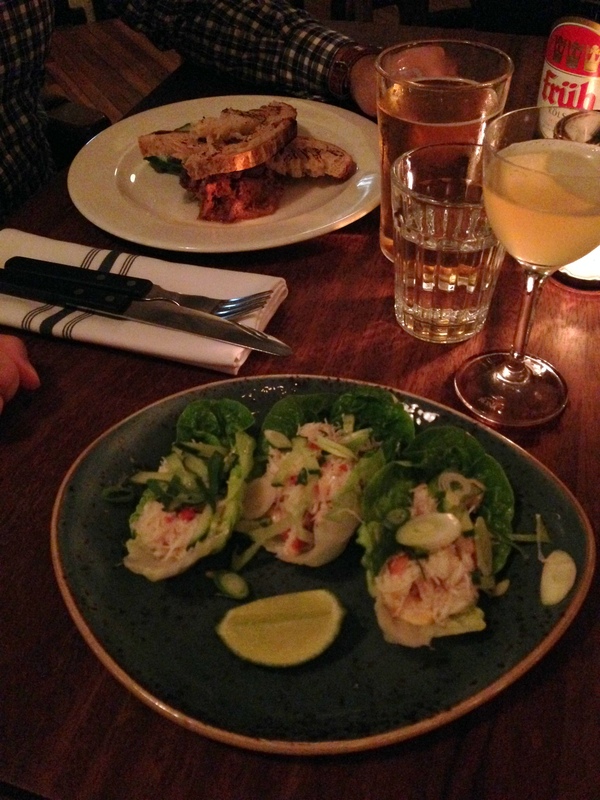 To start I had the Brixham Crab with Sriracha Mayonnaise which was lovely and fresh although a little lacking in oomph the sauce gave a nice tang. Tom had the Smokehouse Rilletes which was incredible, like a pulled pork pate served with sourdough bread creamy and smoky and very rich; in a tomato-ey mushroom-ey sauce which the fat has melted into this really is something special. To follow I had what is commonly thought of as the main event the Short Rib with Kimichi, a melt in your mouth ‘OMG’ moment of rich earthy meaty flavour balanced by the crunchy tangy spice of the kimchi made this a dish I would go back for. 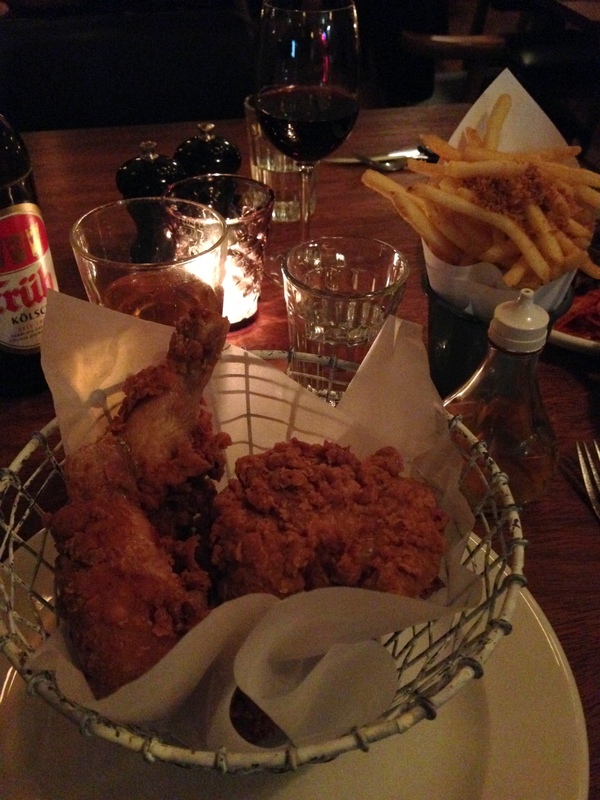 Tom ended up plumping for the Foxlow Fried Chicken with Habanero Vinegar which was served hipster style in a wire basket with the vinegar in an old fashioned ‘fish & chip’ glass shaker. The chicken pieces were huge and juicy and not at all greasy and the spicy vinegar was a fun and useful edition, but after all it was ‘just’ fried chicken and unless you are a huge fan I would recommend something more unusual on the menu. We accompanied our mains with the Skin on Fries with Chicken Salt which were perfectly crisp and thin and the chicken salt provided the extra flavour undoing the need for a condiment, and Wild Lettuce and Peas, which didn’t really make-up for the total carb and meat feast we were devouring. For wine we went red with the Hacienda Grimon; a Rioja that was smooth, creamy and went down a little too easily! I was ready to skip pud but the staff very sweetly bought over a lemon cheesecake with the little candle in it, cheesecake is my favourite dessert and it was a nice touch for them to ask Tom what pudding I would prefer whilst I was away from the table. All in all I would recommend Foxlow if you are after a hearty meal in a cool environment with friendly staff especially as it’s the exact type of food I want to eat as the months get colder. 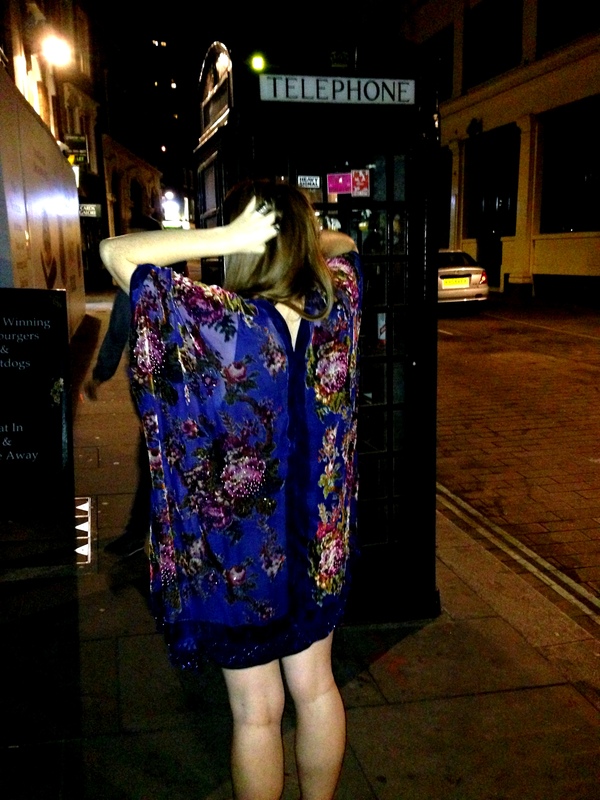 This entry was posted in The Life and tagged ash, mulberry, Urban Outfitters, Velvet Kimono Company. Bookmark the permalink.